The Des Moines Social Club is an innovative arts and entertainment venue located in a renovated, historic art deco Firehouse in downtown Des Moines at 900 Mulberry. The non-profit provides a home for local artists, offers unique programming spanning all arts disciplines, and brings people of every age and background together under one roof — all for the purpose to use the arts as a catalyst to create unprecedented community engagement. On any given night at the Des Moines Social Club, you may see thought-provoking theater, pop-up art galleries, circus classes, entertaining trivia competitions, live music, or art courses for kids — all happening simultaneously. There’s something for everyone at the Des Moines Social Club. 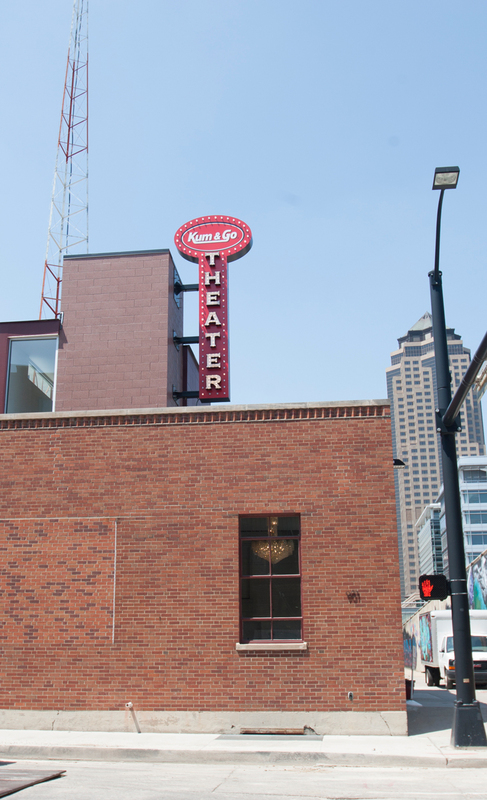 The Des Moines Social Club spans two buildings, multiple floors, an outdoor courtyard and features Viaduct Gallery, Kum & Go Theater, Malo Restaurant, and Capes Kafé, as well as numerous performance spaces, classrooms, and non-profit office space. The recognizable list of local sponsors includes Kum & Go, Principal Financial, Pioneer, John Deere, Meredith, Wellmark Blue Cross & Blue Shield, US Bank, Bankers Trust, Prairie Meadows, Voya Financial, Wells Fargo, Unity Point Health, Drake and Grand View University. ASI Signage Innovations along with Sling Shot Architecture provided a turn-key design-build solution for both interior & exterior identification and wayfinding signage. Initially ASI was consulted for wayfinding & ADA compliancy but it quickly led to inclusion of the exterior signage as well. For the construction of the exterior marquee identification and interior theater wall sign, ASI coordinated with both ImageFirst™, who manufactured the exterior signs, and a structural civil engineer to bring the ultimate solution to reality. Because this was a historic preservation project it definitely had several challenges. The signage design brings an older vintage street side theater/marquee style with chasing light effect to the more nostalgic restored fire station building. Furthermore a set of face-lit letters were designed & built with RGB color-changing LED illumination for an enhanced seasonal affect. ASI and ImageFirst™ accomplished the project under strenuous deadlines due to the planning of a grand opening of the facility that was also essential to the marketing of the facility to the community & sponsors. See more photos at desmoinessocialclub.org/photos. ImageFirst did a great job, from bidding to completion of the project. Scott and Dave were excellent to work with and did everything within their power to make sure the job was a success.